Steven A. Camarota is the director of research and Karen Zeigler is a demographer at the Center. This analysis is based on newly released data from the Census Bureau. The analysis shows that 1.03 million immigrants (legal and illegal) settled in the United States in the first six months of 2016. Based on prior patterns, a total of 1.8 million immigrants likely came in all of 2016. The new data shows a dramatic rebound in immigration after 2011, when new arrivals fell after the Great Recession. Newly arrived immigrants include new green card holders (permanent residents) and long-term “temporary” visitors, such as guestworkers and foreign students, many of whom eventually become permanent residents. It also includes new asylum seekers, as well as new illegal immigrants who cross the border surreptitiously or overstay a temporary visa. More than one million new immigrants (legal and illegal) settled in the country in the first six months of 2016. This represents a 13 percent increase over the same period in 2015, a 21 percent increase over 2014, and a 53 percent increase over 2011, when new immigration reached a low point after the recession. 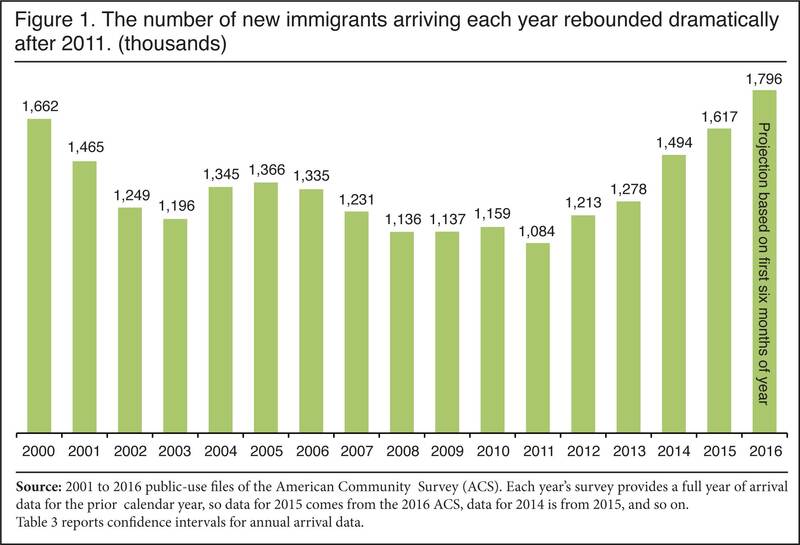 The 1.03 million new immigrants who came in the first six months of 2016 is larger than the number of immigrants who came in all of 2011. The 1.8 million immigrants who likely came in 2016 and the 1.6 million who came in 2015 are a continuation of a dramatic rebound in immigration since 2011. In 2014, 1.5 million came, in 2013 it was 1.3 million, in 2012 it was 1.2 million, and in 2011 1.1 million new immigrants settled in the country. The dramatic increase in new immigrants settling in the United States in recent years is primarily driven by the nation’s generous legal immigration system for both long-term temporary visa holders (e.g. guestworkers and foreign students) and new permanent residents (green card holders). Data Source. In October 2017 the Census Bureau released the public-use data from the 2016 American Community Survey (ACS). The survey reflects the U.S. population as of July 1, 2016. The ACS is by far the largest survey taken by the federal government each year and includes over two million households.6 In September, the Census Bureau posted some of the results from the ACS to its American FactFinder system. However, only by analyzing the public-use micro data from the ACS, not the tables generated from FactFinder, can we measure new arrivals, as shown in Figures 1 and 2. To measure the number of new arrivals, we use what is often referred to as the year-of-arrival question in the ACS. The survey asks respondents what year they came to the United States to live. Immigrants, including recent arrivals, are typically referred to as the foreign-born by the Census Bureau. These are individuals who were not U.S. citizens at birth. It includes naturalized citizens, legal permanent residents (green card holders), temporary workers, and foreign students. It does not include those born to immigrants in the United States, including to illegal immigrant parents, or those born in outlying U.S. territories such as Puerto Rico. In addition, prior research by the Department of Homeland Security and others indicates that some 90 percent of illegal immigrants respond to the ACS.7 Thus all the figures reported above are for both legal and illegal immigrants. Newly arrived immigrants captured in the Census Bureau’s ACS include the foreign-born as described above. It does not include those who come to the United State for short stays such as tourists or business travelers. The ACS uses a two-month rule to determine who will be included in the survey. That is, the survey counts anyone residing for at least two months at an address. While there are very few newly arrived immigrants in institutions, the ACS does include that population as well, which includes prisons and nursing homes.8 Since the survey represents the population at mid-year, it is necessary to wait until next year’s ACS is released to get a complete picture of the total number of immigrants for the year. So, for example, the total number of new arrivals in 2015 was available once the 2016 ACS was released. However, the number of new arrivals in the first six months of the year is also available. Data from the first half of the year can be used to project the likely number of new arrivals for the full year based on prior patterns. Based on the first six months of data, CIS projected last year that once it was released the ACS would show 1.59 million new immigrants settled in the United States in 2015. As Figure 1 shows, the new ACS data shows that 1.62 million came in 2015 — a 2 percent difference from the CIS projection last year. Based on the 1.031 million who arrived in the first quarter of 2016, we project that new arrivals for all of 2016 will total 1.796 million, as shown in Figure 1. 1 The 2000 Census showed that 1.797 million new immigrants settled in the country in 1999. This almost exactly matches our full-year projection for 2016 of 1.796 million. We will have to wait until next year to confirm our projection. As the ACS was not collected nationally on an annual basis before 2000 and the decennial Census data is only available every 10 years, we cannot be certain of the annual number of new arrivals in the 1990s. (Note: 2000 was the last time a decennial census distinguished the foreign-born population.) So there is no way to directly measure the number of immigrants arriving in the 1990s by individual year. It is possible that new arrivals exceeded 1.8 million a year at some point between 1990 and 1998. That said, the decennial Census and arrival data in another, smaller Census Bureau survey called the Current Population Survey (CPS), which was collected from 1994 on, do not indicate that annual immigration (legal and illegal) ever reached 1.8 million before 1999. The individual year of arrival data from the 2000 census for 1990 to 1998 reflect out-migration and a small amount of mortality, reducing their size by the year 2000. 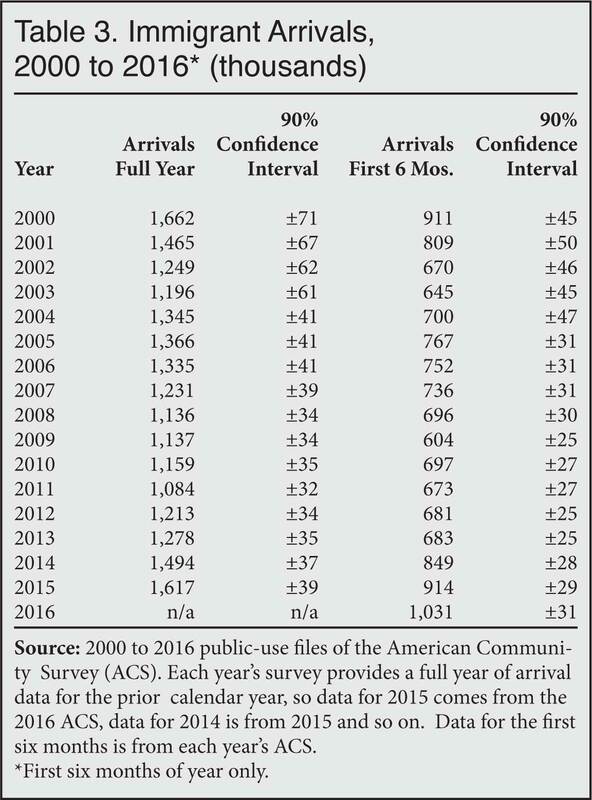 In 2005, the Pew Research Center attempted to estimate individual year of arrival data from 1990 to 2004 by averaging results from the 2000 census, the ACS, and the CPS. After making allowances for out-migration and mortality, their research shows that, other than 1999, the highest year of new immigration was 1998, when 1.462 million immigrants arrived. Pew’s findings confirm that new arrivals did not exceed 1.8 million at any point in the 1990s. 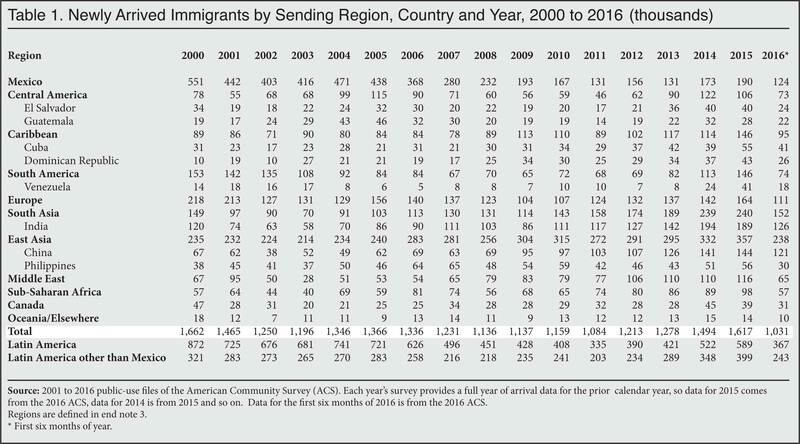 See Table 1a in Jeffrey Passel and Roberto Suro, “Rise, Peak and Decline: Trends in U.S. Immigration 1992 – 2004”, Pew Research Center, 2005. In addition to Census Bureau data, there is also yearly admissions data on new legal immigrants going back to 1820, which shows that the largest number of new legal immigrants admitted in a single year in American history was 1.218 million in 1914. (It may be worth adding that during the IRCA legalizations in both 1990 and 1991 the number of new green cards issued each year was higher than 1.218 million, though these were illegal immigrants receiving amnesty, not new arrivals. The figures also include non-illegal immigrants receiving green cards who were adjusting status from within the United States, so they, too, were not new arrivals.) In short, if our projection for 2016 is correct, then the number of new arrivals (legal and illegal) in that year roughly matched the level in 1999, making 2016 and 1999 tied for the two highest years of immigration in American history. 2 To arrive at our projection for 2016 we simply average the ratio of new arrivals for the first six months of each year to the number of new of arrivals for the full year once the full-year data is released (2010 to 2015). There were 1.742 new arrivals on average in the full-year data once it was released, compared to the half-year data released in the prior year. We simply multiply 1.742 by the 1.031 million who arrived in the first six months of 2016 to get our full-year projection of 1.796 million as shown in Figure 1. 3 The regions in this report are defined in the following manner: Countries that can be identified in the public-use 2016 ACS file are coded as the following regions: Mexico; Central America: Belize, Costa Rica, El Salvador, Guatemala, Honduras, Nicaragua, and Panama; South America: Argentina, Bolivia, Brazil, Chile, Colombia, Ecuador, Guyana, Paraguay, Peru, Uruguay, Venezuela, and South America not specified; Caribbean: Bermuda, Cuba, Dominican Republic, Haiti, Jamaica, Antigua-Barbuda, Bahamas, Barbados, Dominica, Grenada, St. Lucia, St. Vincent, Trinidad and Tobago, and Caribbean and West Indies and Americas not specified; South Asia: India, Bangladesh, Pakistan, Sri Lanka, Bhutan, and Nepal; East Asia: China, Hong Kong, Taiwan, Japan, Korea, Cambodia, Indonesia, Laos, Malaysia, Philippines, Singapore, Thailand, Vietnam, Burma, Asia not specified; Europe: Denmark, Finland, Iceland, Norway, Sweden, England, Scotland, United Kingdom, Ireland, Belgium, France, Netherlands, Switzerland, Albania, Greece, Macedonia, Italy, Portugal, Azores, Spain, Austria, Bulgaria, Czechoslovakia, Slovakia, Czech Republic, Germany, Hungary, Poland, Romania, Yugoslavia, Croatia, Bosnia, Serbia, Montenegro, Cyprus, Latvia, Lithuania, Byelorussia, Moldova, Ukraine, Armenia, Georgia, Russia, USSR not specified, and Europe not specified; Middle East: Afghanistan, Azerbaijan, Kazakhstan, Uzbekistan, Iran, Iraq, Israel/Palestine, Jordan, Kuwait, Lebanon, Saudi Arabia, United Arab Emirates, Syria, Turkey, Yemen, Algeria, Egypt, Morocco, Libya, Sudan, and North Africa not specified; Sub-Saharan Africa: Cape Verde, Ghana, Guinea, Liberia, Nigeria, Senegal, Sierra Leone, Ethiopia, Kenya, Somalia, Tanzania, Uganda, Zimbabwe, Eritrea, Cameroon, South Africa, Zaire, Congo, Zambia, Togo, Gambia, and Africa and Western and Eastern Africa not specified; Canada; Oceania/Elsewhere: Australia, New Zealand, Fiji, Tonga, Marshall Islands, Micronesia, Elsewhere. The above list is for 2010 to 2016, in prior years several smaller sending countries cannot be identified individually in the ACS. 4 To estimate the number from Mexico for all of 2016, we take the 124,000 Mexican immigrants who arrived in the first six months of that year (see Table 1) and multiply it by 1.742, as we did with the number for all immigrants. 5 Additional analysis is necessary to confirm this tentative conclusion. However, Figure 4 shows the number of Hispanic immigrants ages 18-40 with only a high school education or less arriving each year based on the ACS. Based on prior research, about three-fourths of this population has traditionally been illegal immigrants. The figure shows that the number of such immigrants entering each year has roughly doubled since 2011, when it hit a low point after the Great Recession. 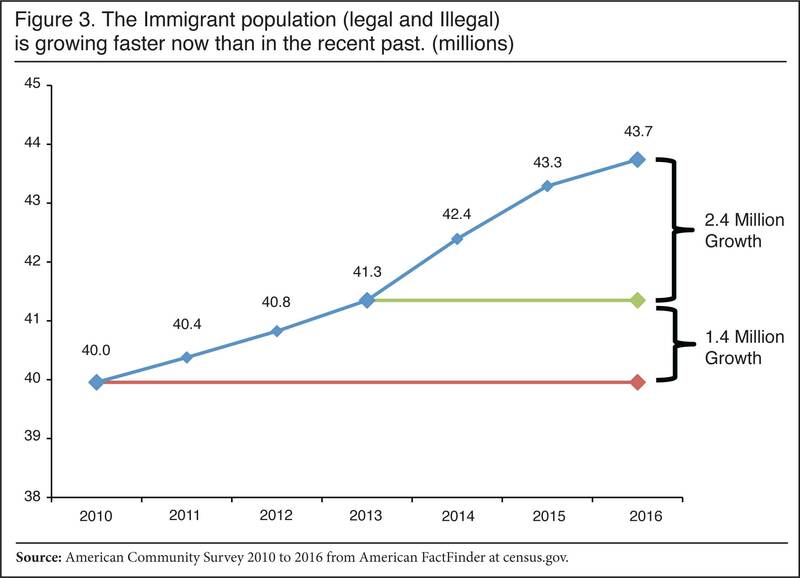 This increase makes it very likely that new illegal immigration has increased somewhat in recent years and may again match the number arriving in 2008 or even 2007, though the level is still well below the number who came annually in earlier years. It should also be remembered that new arrivals are offset by those in the existing population of illegal immigrants who return home or get legal status each year. Thus, an increase in new arrivals may not translate into a larger illegal immigrant population in the country because the overall size of that population reflects both new arrivals and those leaving the illegal population each year. 6 Detailed information on the survey methodology, questions, and other information on the American Community can be found here. 7 The Department of Homeland Security uses the ACS as the basis for its estimates of illegal immigrants. See their most recent estimate of the unauthorized immigrant population: Bryan Baker and Nancy Rytina, “Estimates of the Unauthorized Immigrant Population Residing in the United States: January 2012”, Department of Homeland Security, Office of Immigration Statistics, March 2013. 8 The ACS began to include those in institutions in 2006.